UnitedSiC has expanded its UF3C FAST Series product range by adding a new range of 650V and 1200V high-performance silicon carbide FETs in a TO-247-4L four-pin Kelvin Sense package option. Based on an efficient cascode configuration, these new products give designers very fast switching, high-power devices in a package able to provide high-power dissipation. The Kelvin package bypasses gate ringing and false triggering which would otherwise need slowing of switching speeds to handle the large common source inductance of three-leaded packages. The four-leaded Kelvin connection packages provide maximum operating temperatures of 175C, good reverse recovery, low gate charge along with up to 2X lower switching losses. 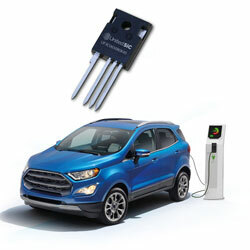 Designers of Totem Pole PFC stages, LLC and Phase Shifted Full Bridge converters, used in EV chargers, telecom and server power applications can obtain new levels of efficiency, ease of use, switching speed, and power density with the new series.